If you have been diagnosed with heart disease or diabetes or simply high blood pressure, chances are your doctor has advised you to take weekly or daily blood pressure readings with a home blood pressure monitor. But how do we know these readings are accurate? And furthermore, what do those two numbers even mean? Make sure to take the readings at the same time each day. Take two or three readings one minute apart and record all three results for better accuracy. Have the person sit with her back straight and supported and feet flat on the floor; crossed legs can negatively affect the reading. Place the person’s arm on a flat surface, with the upper arm at heart level. Make sure the middle of the cuff is placed directly over the person’s brachial artery and fits correctly. To find the brachial artery, with the person’s arm out, palm facing up, trace a line from the outside of his thumb, up his outer arm to the bend in his elbow. At that bend is the brachial artery. The person whose blood pressure you are reading should not smoke, drink caffeinated beverages or exercise within 30 minutes before measuring blood pressure. Have the person go to the bathroom prior to the reading, as a full bladder can raise your systolic pressure. Consumer Reports has a helpful blood pressure monitor buying guide that tells you what you should look for in a good home monitor. And for a fun, interactive guide to understanding and managing high blood pressure, check out the American Heart Association’s booklet. 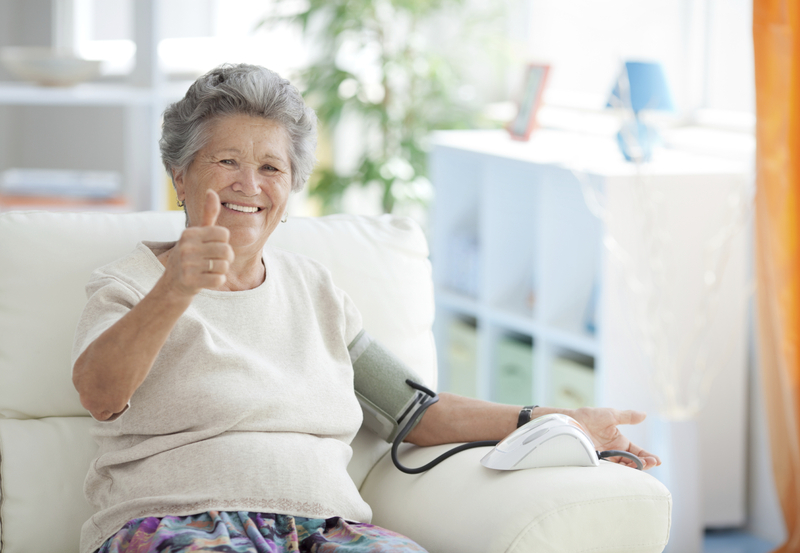 If you or a loved one struggles with maintaining healthy blood pressure, Hired Hands Homecare can help – from planning and preparing healthy meals, to picking up prescriptions and providing medication reminders, to helping a person stay active, and more. We provide in home care in Novato, Santa Rosa, Napa, Pleasanton and many more cities in California. To learn more about our home healthcare services and how we can help your loved one maintain a healthy life, or to set up a free comprehensive consultation, contact us today at (866) 940-4343.